2 pack. 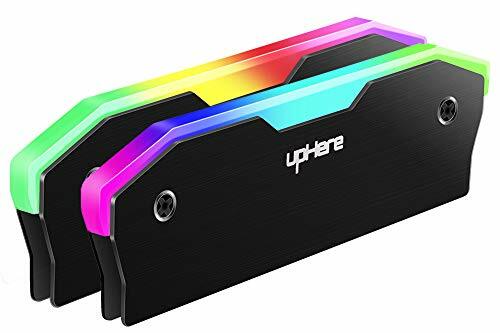 uphere RAM heat sink is a shell of RAM which can be installed on common computer RAM to achieve colorful light effects, users can achieve light effects on RAM with low cost, especially without eliminating their current non-luminous RAM. There is a 256 colors automatic switching function on the top, both sides are made from aluminum magnesium alloy with anode wiredrawing process and equipped with thermal conductive silicone greases to assist the heat dissipation of RAM. It supports high/low and single/double side(s) RAMs, and provides standard small 3 PIN power supply connector with series connection supported to allow several and sharing only one power supply connector. 2 pack.There is a 256 colors automatic switching function on the top. There are 2 pieces of thermal conductive silicone greases inside to assist the heat dissipation of RAM. High/low and single/double side(s) RAMs are supported. Both sides are made from aluminum magnesium alloy with anode wiredrawing process. Standard small 3 PIN power supper connector is provided with series connection supported.